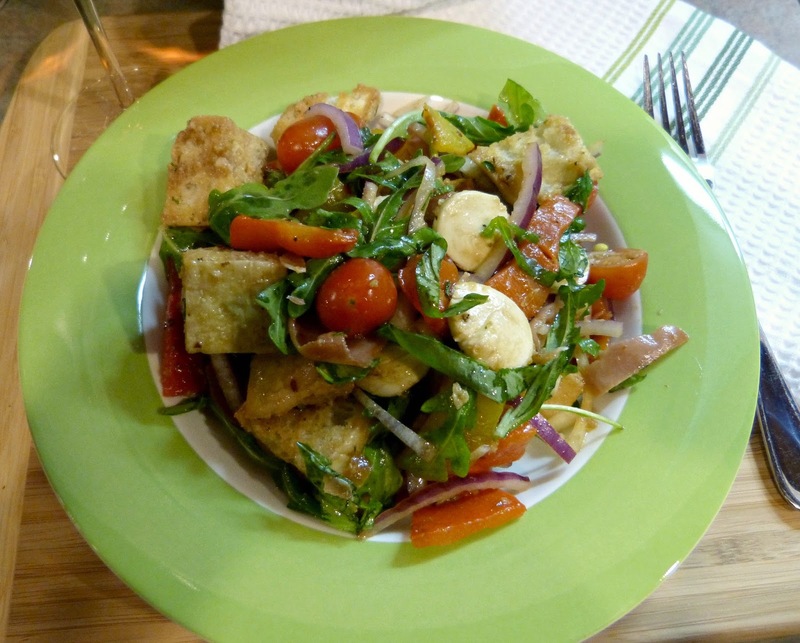 Panzanella is one of my favorite kinds of salad to make. It's hearty enough to serve as a main dish and recently, we did. I think I was trying to will spring to arrive by serving something fresh and bright for dinner. The verdict is still out on whether or not that worked. This bread salad is a fun twist on a classic caprese. I love that simple combo of fresh creamy mozzarella, tangy tomatoes, sweet basil, and a drizzle of balsamic vinegar and olive oil. For this version, I wanted to layer in a few more flavors and make this feel more like a complete meal. I roasted up some sweet bell peppers, chopped a few red onions, and then added peppery arugula and some salty prosciutto to the mix. There are a lot of ingredients here, but they all come together and create a really well balanced and tasty dish. The base of a panzanella is the big chunks of crusty bread that soak up all of the great vinaigrette and vegetable flavors in the dish. It's also rare to find a [dressed] salad that tastes better the second time around. I packed the leftovers from this dinner for lunch the next day and couldn't get enough! And you could skip the prosciutto here and make this dish totally meatless if you wanted! Spread ciabatta pieces out on a baking sheet. Bake for 8-10 minutes until the bread is just golden and crunchy on the outside, but still soft in the middle. Set bread aside and preheat broiler. Cut each bell pepper into 4 large pieces, removing stems, ribs, and seeds. Flatten pepper pieces skin side up onto a foil-lined metal baking sheet. Broil until skin is blackened and blistered. Transfer peppers immediately to a medium sized bowl and cover tightly with plastic wrap. Set aside and let peppers cool, about 10-15 minutes. Peel the skin from the outside of each pepper and discard the skins. Chop into a 1-inch dice and set aside. 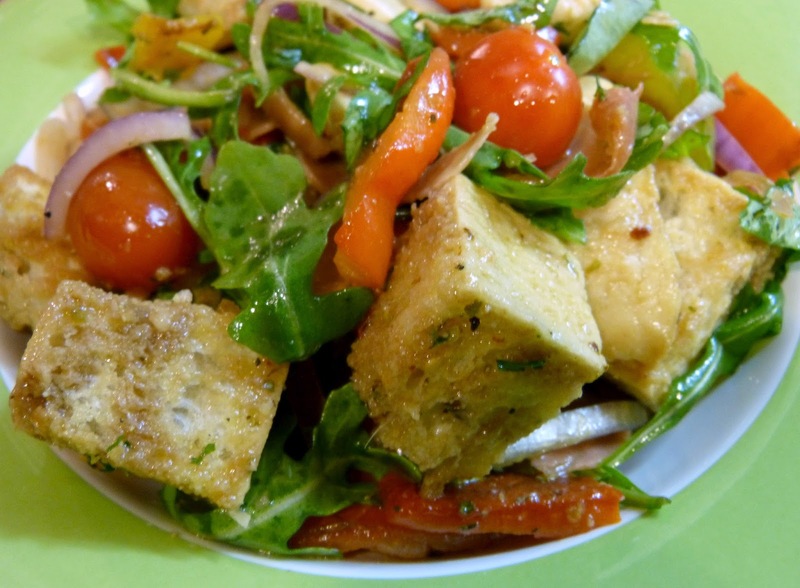 In a large bowl, combine ciabatta, chopped peppers, grape tomatoes, onions, arugula, and basil. In a small bowl, whisk together olive oil, vinegars, honey, garlic, parsley, oregano, red pepper flakes, salt, and pepper until fully incorporated. Pour over the ciabatta mixture and toss to coat. Let that mixutre sit at room temperature for about 15 minutes, stirring occasionally. Stir in bocconcini and prosciutto and serve in shallow bowls. Makes 3 entree or 6 side dish servings. 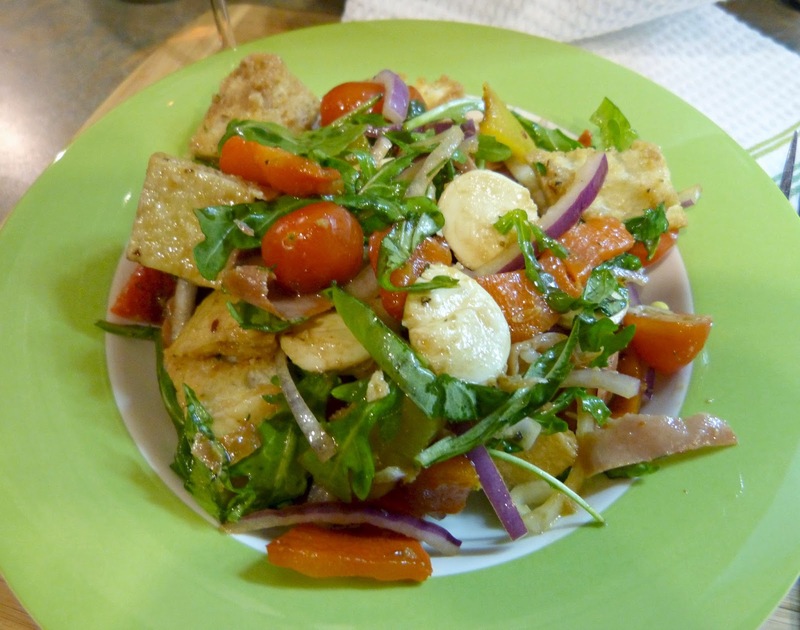 I love a good panzanella! Give Grilled Corn Panzanella or BLT Panzanella Salad a try.